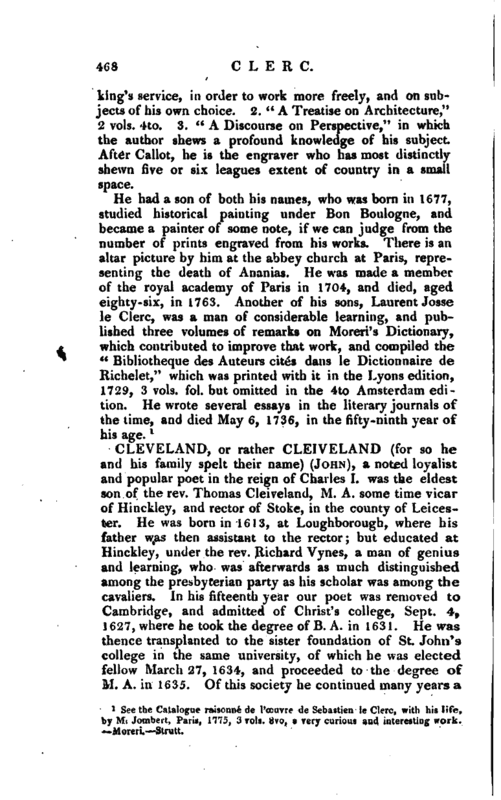 , or rather Cleiveland (for so he and his family spelt their name) (John), a noted loyalist and popular poet in the reign of Charles I. was the eldest son of the rev. Thomas Cleiveland, M. A. some time vicar of Hinckley, and rector of Stoke, in the county of Leicester. He was born in 1613, at Loughborough, where his father was then assistant to the rector; but educated at Hinckley, under the rev. Richard Vynes, a man of genius and learning, who was afterwards as much distinguished among the presbyterian party as his scholar was among the cavaliers. In his fifteenth year our poet was removed to Cambridge, and admitted of Christ’s college, Sept. 4, 1627, where he took the degree of B. A. in 163 1 He was thence transplanted to the sister foundation of St. John’s college in the same university, of which he was elected fellow March 27, 1634, and proceeded to the degree of M. A. in 1635. Of this society he continued many years a | principal ornament, being one of the tutors, and highly respected by his pupils, some of -whom afterwards attained to eminence. By the statutes of that college, he should have taken orders within six years after his being elected fellow: but he uas admitted on the law line (as the phrase there is) November 2, 1640, and afterwards on that of physic, January 31, 1642, which excused him from complying with this obligation; though it does not appear that he made either law or physic his profession: for, remaining at college, he became the rhetoric reader there, and was usually employed by the society in composing their speeches and epistles to eminent persons (of which specimens may be seen in his works), being in high repute at that time for the purity and terseness of his Latin style. He also became celebrated for his occasional poems in English, and, at the breaking out of the civil wars, is said to have been the first champion that appeared in verse for the royal cause; which he also supported by all his personal influence: particularly by exerting his interest in the town of Cambridge, to prevent Oliver Cromwell (then an obscure candidate, but strongly supported by the puritan partv) from being elected one of its members. Cromwell’s stronger genius in this, as hi every other pursuit, prevailing, Cleveland is said to have shown great discernment, by predicting at so early a period, the fatal consequences that long after ensued to the cause of royalty. Cromwell got his election by a single vote, which Cleveland declared “had ruined both church and kingdom.” The parliament party carrying all before them in the eastern counties, Cleveland retired to the royal army, and with it to the king’s head quarters at Oxford, where he was much admired and caressed for his satirical poems on the opposite faction, especially for his satire on the Scottish covenanters, entitled “The Rebel Scot.” In his absence he was deprived of his fellowship, Feb. 13, 1644, by the earl of Manchester, who, under the authority of an ordinance of parliament, for regulating and reforming the university of Cambridge, ejected such fellows of colleges, &c. as refused to take the solemn league and covenant. From Oxford Cleveland was appointed to be judge-advocate in the garrison at Newark, under sir Richard Willis the governor, and has been commended for his skilful and upright conduct in this difficult office, where he also distinguished his pen occasionally, by returning smart answers to the | summons, and other addresses to the garrison. Newark, after holding out the last of all the royal fortresses, was at length, in 1646, by the express command of the king (then a prisoner in the Scots army), surrendered upon terms, which left Cleveland in possession of his liberty, but destitute of all means of support, except what he derived from the hospitality and generosity of his brother loyalists, among whom he lived some years, obscure and unnoticed by the ruling party, till, in November 1655, he was seized at Norwich, as “a person of great abilities,” adverse and dangerous to the reigning government; and being sent to Yarmouth, he was there imprisoned for some time, till he sent a petition to the lord-protector, wherein the address of the writer has been much admired, who, while he honestly avows his principles, has recourse to such moving topics, as might sooth his oppressor, and procure his enlargement: in which he was not disappointed, for the protector generously set him at liberty, disdaining to remember on the throne the opposition he had received in his canvass for parliament as a private burgess. 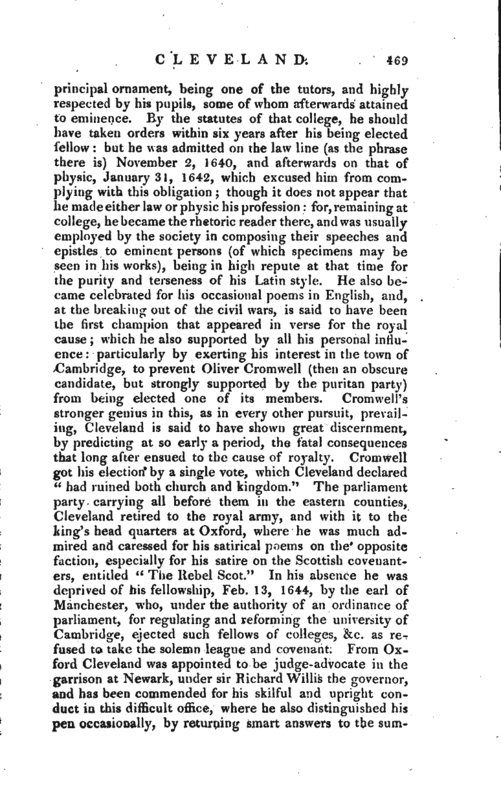 Cleveland thence retired to London, where he is said to have found a generous Maecenas; and, being much admired among all persons of his own party, became member of a club of wits and loyalists, which Butler, the author of Hiir dibras, also frequented. Cleveland then lived in chambers at Gray’s-inn (of which Butler is said to have been a member), and, being seized with an epidemic intermitting fever, died there on Thursday morning, April 29, 1659. His friends paid the last honours to his remains by a splendid funeral: for his body was removed to Hunsdon -house, and thence carried for interment, on Saturday May 1, to the parish church of St. Michael Royal, on College-hill, London, followed by a numerous attendance of persons eminent for their loyalty or learning: to whom his funeral sermon was preached by his intimate friend Dr. John Pearson, afterwards bishop of Chester, author of the Exposition of the Creed. 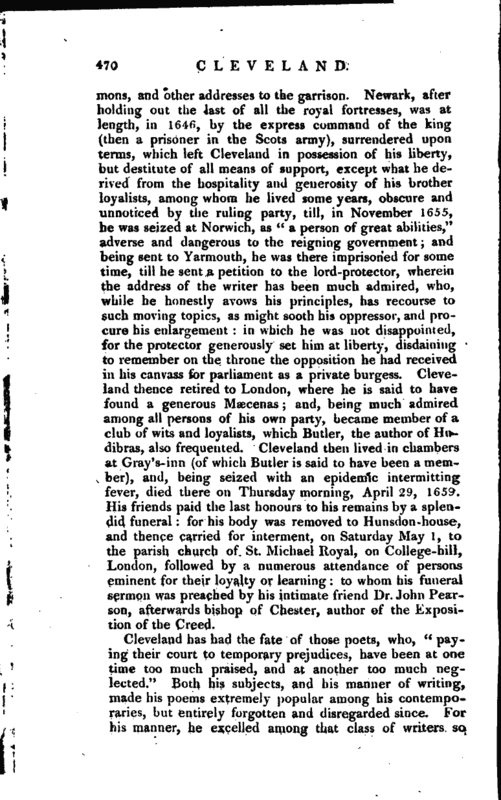 Cleveland has had the fate of those poets, who, “paying their court to temporary prejudices, have been at one time too much praised, and at another too much neglected.” Both his subjects, and his manner of writing, made his poems extremely popular among his contemporaries, but entirely forgotten and disregarded since. For his manner, he excelled among that class of writers so | much admired in the last century, whom our great critic has aptly termed “metaphysical poets, who abound with witty rather than just thoughts, with far-fetched conceits, and learned allusions, that only amuse for a moment, utterly neglecting that beautiful simplicity and propriety which will interest and please through every age.” For his subjects he generally chose the party disputes of the day, which are now no longer understood or regard-ed. Contemporary with Milton, he was in his time exceedingly preferred before him; and Milton’s own nephew, Phillips, tells us, he was by some esteemed the best of the English poets. But Cleveland is now sunk into oblivion, while Milton’s fame is universally diffused. 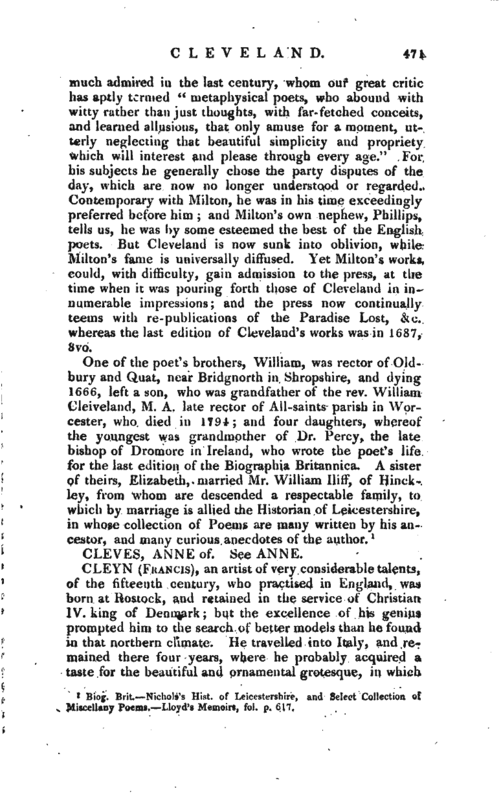 Yet Milton’s works could, with difficulty, gain admission to the press, at the time when it was pouring forth those of Cleveland in innumerable impressions; and the press now continually teems with re- publications of the Paradise Lost, &c. whereas the last edition of Cleveland’s works was in 1687, 8vo. 1 Biog. Brit. Nichols’s Hist, of Leicestershire, and Select Collection of Miscellany Poems. Lloyd’s Memoirs, fol. p. 617.